Love Letter, a simple card game comprised of 16 cards, is nonetheless so fun that it compelled me to record my first video review almost a year ago. Looking back, it wasn't naivety that led me to fall in love with the game, but rather original design, interesting art, and a near-perfect mix of bluffing and strategy. It's hard to imagine my collection of games without Love Letter. I've bought dozens of copies of the game as gifts for friends, and it's my go-to recommendation for anyone looking for a "light" game, or for new gamers looking for something to share with their friends. Truly, Love Letter is one of the best games I've ever played. Catch the video and my review after the jump. Enjoy! In Love Letter players take turns drawing and playing cards until a single player is left standing, or until the deck of 16 cards runs out, at which point the player with the highest remaining card is the winner of the round. The player who wins a set number of rounds first wins the game. Thematically, players are nobles in the Kingdom of Tempest attempting to pass a love letter through members of the court to the Princess, and to presumably win her love. I have no idea what's actually written in the letter, but it must be truly powerful writing to be so effective! The game plays quickly and easily. Players have only a single card in hand unless it's their turn, so decisions are reasonably simple, and the real meat of the game comes from trying to determine what cards other players have while attempting to mask your own. There are a number of ways to eliminate the other players, the most common being to use a "Guard" to guess the card your opponent has in-hand, or to use a "Baron" to secretly compare cards and eliminate the player with the lower card. If you're the type of person who thinks of such things, it's easy to see how you could cheat by not admitting when another player guessed your card. Fortunately, the rulemakers in the courts of Tempest thought of this, and included a stipulation in the Love Letter rule book: "We suggest that you don’t play with knaves who cheat at fun, light games." For that reason alone I adore this game, but there are plenty of other reasons to enjoy it. 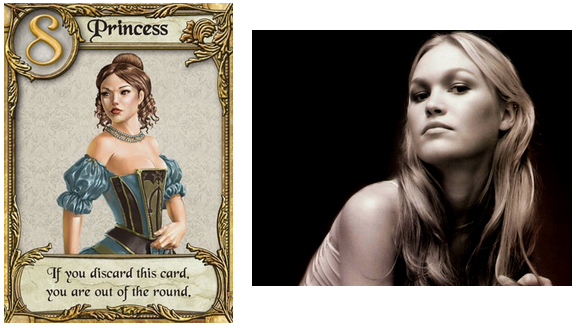 The card art is great, for what it is (I believe the Princess looks like Julia Stiles and the Priest looks like Nicholas Cage) and the card abilities match up well with the theme of the game. See? Tell me I'm wrong. I rate Love Letter as my favorite light card game of all time, and it will be hard for it to be eclipsed. It's easy to teach, easy to play, can be carried anywhere the pocket of my jacket or backpack, and lends itself to inside jokes, grudges held, and round after round of quick, enjoyable play. If that's not enough to sell you, the game is $10-$12 at most retailers, and I've never heard a person regret picking it up. Grab a copy at your Friendly Local Game Store, and pick up an extra for the next time you need a wedding present - the theme makes it a totally passable gift!